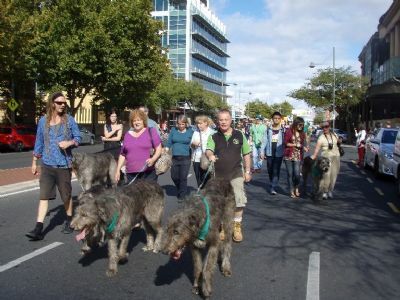 The Irish Wolfhound Club of South Australia Inc. The South Australian Irish Wolfhound Club Inc started life back in 1996 by a group of Owners and Breeders in the hope that this would help the breed flourish and provide the Show Ring a quantity of these beautiful dogs. Our membership extends throughout Australia and New Zealand with overseas members in The United Kingdom and the United States. Our Membership is open to everyone including other breed owners and all will be made most welcome – for more information please contact the Secretary of the Club. Our Club magazine is published Quarterly and posted to all members. Within the State of South Australia, shows are held under the auspices of Dogs SA which is located at SACA Park, Cromwell Road, Kilburn.